WHAT IS THE LATINUM COURSE? Latinum on Patreon allows me to offer you, for a small monthly subscription (which you are not locked in to - you can cancel at any time), access to my entire catalogue of course material. A subscription to Latinum is extremely good value for money. You can cheaply subscribe as a basic level patron, and later, if you don't find it useful, or no longer want to support Latinum, it is very easy to quit. It is also easy to upgrade to the higher tier later on if you want to download my audiobooks in zip format. The Latinum Course is an online multi-level and multi-media Latin course, with a growing complement of recorded supplementary material, that has been growing steadily since Evan started creating it in early 2007. The core of the course is Adler's Practical Grammar of the Latin Language - which took Evan der Millner two years of full-time labour to produce as a stand-alone audio course - vastly expanding the material in an already comprehensive textbook of Latin. 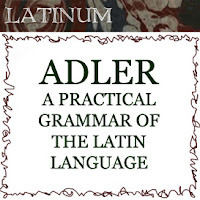 If you want to master Latin, Adler's course as presented by Latinum is all that you will require. Why an audio course for a dead language? You need to 'fire on all cylinders' - and to speed up language learning, the dead language has to be treated - for learning purposes - as though it were indeed alive - to help you make as many neural connections as possible. This must involve reading, writing, listening, and speaking. Few formal Latin courses spend much time on the latter two, which, to my mind, are the most important of the four, especially for a beginner. Also, classroom based language courses simply cannot provide the intensive exposure needed, and the hours of tuition required, to master a language quickly. What do you get if you become a patron of Latinum? Every patron can freely access and stream hundreds of hours of a growing corpus of Latin audiobooks and learning materials, either here on the Patreon website, or by using Patreon's Apple or Android app. Higher reward tier patrons can also download a large catalogue of audiobooks and other materials as zip files. I have also curated a selection of my YouTube materials - including my 'Latin in Latin' Course, and the 'London Latin Course', both of which I recommend you use alongside Adler. The most complete Latin Audio Course and support resource collection available online. ADLER'S PRACTICAL GRAMMAR AUDIO COURSE - 191 HOURS OF TUITION.